Once again, the Snake River figures prominently in many Idaho placer gold areas and districts. Nearly 2,000 troy ounces were pulled from the Snake's bars and gravel benches in Jerome County, but take note: most of this placer gold was in the form of fines and small flakes. Your main mining focus in Kootenai County should be in the Coeur d'Alene District . Nearly every stream in the District will be carrying some placer gold, and color is fairly easy to find here. Your best bet in Minidoka County will be the benches and bars of the Snake River. However, recorded gold production figures in the county are not very high, so you may want to try your hand in Idaho counties with a proven track record of large amounts of placer gold. Nearly all the creeks, gulches, rivers, and streams in and around Lewiston, Idaho carry decent amounts of placer gold. Keep your eyes open here, especially when it comes to terrace and bench gravels sitting high and dry above existing stream courses. I've heard reports of some exceptional gold recoveries from selected terraces and benches, especially those upstream from Lewiston along the Clearwater River. There is one main area in Power County that has the greatest gold potential for small-scale or recreational miners and that can be found (once again) on the Snake River near American Falls. Lots of mining activity took place (and still does on a smaller scale) in Shoshone County. Although the area around Kellogg was more of a silver mining region, some minor gold placers can be found in the drainages below some of the better-known hard-rock mines. Murray, which was once on its way to being a complete ghost town, is noted for having produced some very large, multi-ounce placer nuggets . Many of these have been recovered right within the so-called "city limits" of this small community, so this area may hold good potential for nugget shooters. 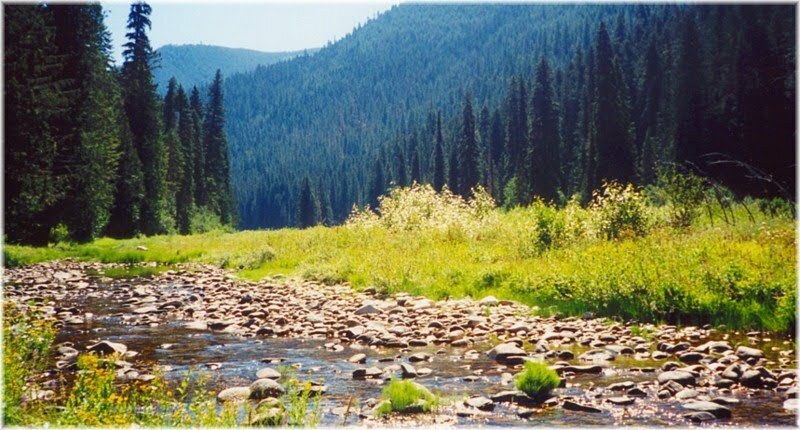 Other areas to sample or nugget hunt can be found along Eagle and Prichard Creeks, both of which were once good placer gold producers. As you can see from this series of posts, Idaho holds great potential for small-scale and recreational placer miners. In light of the current difficulties for miners in California and elsewhere in the West these days, perhaps we all need to take a closer look at the "Gem State." Thanks for commenting Don. I've already done some posts on gold in S. Carolina. Try this URL:http://goldbedrockgold.blogspot.com/2009/07/gold-in-southeast-south-carolina-part-1.html. Remember, "Bedrock Dreams" has a search function located on the right sidebar. I appreciate your support. J.R.